JOSH Corner got his 2014 Motorpoint British Supersport Evo campaign off to a solid start at Brands Hatch over the Easter weekend. The teenager bounced back from a crash during Sunday’s qualifying session to score an eighth and a fourth in class in the weekend’s two races. Corner and the Alpha Paints Ltd/MJJ Motorsport team arrived at the Kent track still suffering from a crash in pre-season testing earlier this month. His Kawasaki had just returned from MSS Performance where Nick Morgan had been working his magic to get it ship-shape again in time for the first round. Still in pain after the crash, Corner spent a couple of days getting used to his machine and the short Indy Circuit, but was one of a number of riders caught out by the wet conditions during Sunday’s qualifying. As a result he started that afternoon’s first race from the back of the grid, but battled his way through to finish 21st overall and eighth in class. For Monday’s race he started higher up in 25th spot, and got a quick getaway at the green light, battling his way up to 18th overall by the chequered flag and fourth in class, narrowly missing out on a podium. “It was a decent weekend all in all, especially as I went there still sore and beaten up from the crash the week before,” he said. “It was always going to be a case of damage limitation at Brands Hatch and I think we did a good job. Obviously I’d have liked better results but I think it was the best we could manage given the situation. 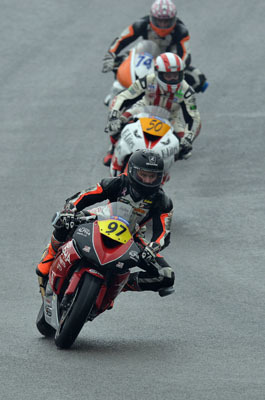 Josh Corner now sits in fifth place in the Motorpoint British Supersport Evo Championship on 21 points. The next round will be held at Oulton Park over the weekend May 3-5, 2014.